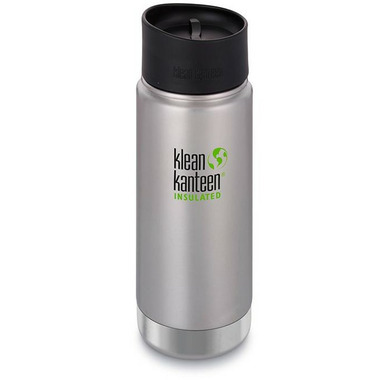 The Insulated Wide 16oz is the best stainless steel coffee mug solution for hot coffee, hot tea or your favorite iced drinks. Leak proof Café Cap 2.0 is easy to drink from, clean and keeps liquids contained. Climate Lock™ double-wall vacuum insulation keeps drinks hot for 8 hours and iced for 24 hours! Klean Coat™ powder coat finish is 4X more durable, chip-resistant and safe for people and planet. I LOVE this coffee mug. I've had many different ones over the years, but this one is the best, keeps coffee hot for hours, just the right size and the lid is so great for drinking. Best travel coffee mug I've tried. Keeps drinks hot/cold all day and no leaks. The lid comes apart for easy cleaning. The brushed metal can show minor signs of wear over time, but generally looks great! Great water bottle! The outside can be hot from sitting in the sun but the drink stays cold. No leaking.